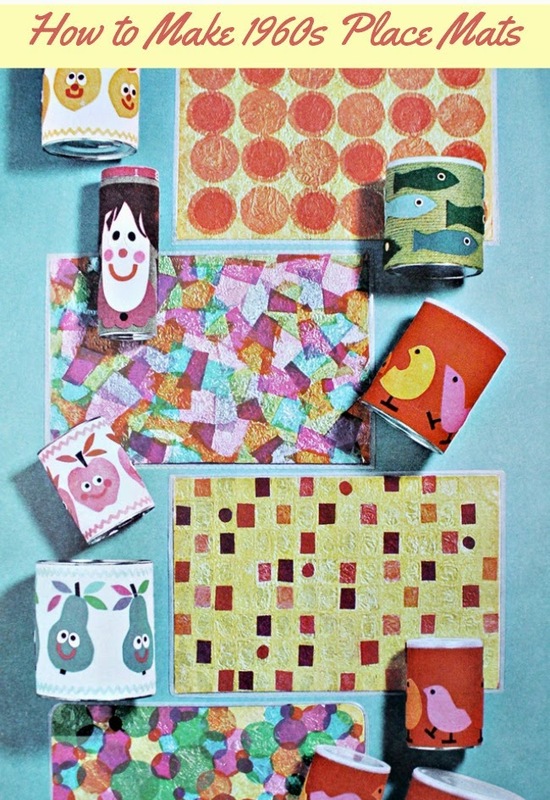 On Tuesday afternoon, the kids and I made some really fun 1960s place mats that I found in one of my vintage craft magazines. This a great no-sew project for a rainy day and even better when little ones can help too! I think we'll have to make different sets for each of the holidays. Wouldn't these be cute as Easter eggs or Christmas trees? gently crumple your foil into a ball, then unfold and flatten out. Rhys got a little too excited with his foil ball crumpling so we had to re-do. No big deal, there's plenty of foil in the roll. We had fun pounding the foil flat with our palms. arrange shapes of tissue however you like. Overlapping colors will show through, which can create a really neat effect. When you're done with your tissue, lay them flat to dry for several hours. trim a little bit off the edges of the place mats. I trimmed about a half inch on each side. Don't you love the bacon and eggs? lay the place mat face down on the table. peel the backing off the contact paper and lay sticky side down on the back of the place mat. The contact paper is slightly larger than the finished place mat so you should have about an inch border all the way around the place mat. This border is really helpful in not getting bubbles in your contact paper. If you stick the border to the table, all you have to do is pull the roll towards you as you encase the place mat. Trim off the excess border and you're done! They're pretty silly but most mid century craft decor is and they're really fun to make! Oooh, that is really cute! Granted, I need a table before I move on to placemats, but this is definitely one to bookmark. ZOMG. I've been trying to figure out how to do something special with my girl scout troop situpons, and your placemat tutorial could be totally adapted to make some extra-special situpons! I normally love your site, but now I really LOVE your site! hah! Thank you!! I thought about Girl Scouts while I was doing this too because my sister in law is a troop leader. I'll be doing a lot more kid-friendly vintage crafts coming up. My kids love doing these kinds of things and I love to craft with them! Super fun! I think this would be such a great idea to make with kids if one has a Girl Guide, Girl Scout, or Boy Scout troop - perhaps mats with a camping or badge work related theme. Thanks for sharing this cool craft with us, dear gal.